My cousin Niki is one smart cookie. There isn’t a lot that gets her down. Just look at that smile. 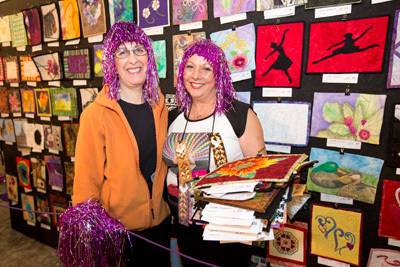 That’s us at the Alzheimer’s Art Quilt Initiative booth last year in Houston. I was thinking a lot about Niki the last few weeks. I was in need of an attitude adjustment. Recently I decided to channel Niki. My recent “opportunities” have all been associated with writing and designing the pattern for my new Amazing Puzzle Ball pattern. I won’t bore you with the details as they were all computer and software related issues (er, “opportunities”), except to say that I have learned a bunch of new things. As soon as I started flipping out, I tried to re-frame the problem as an opportunity. It really helped! Here’s a quilting example. Do you remember the quilt I made for my niece? 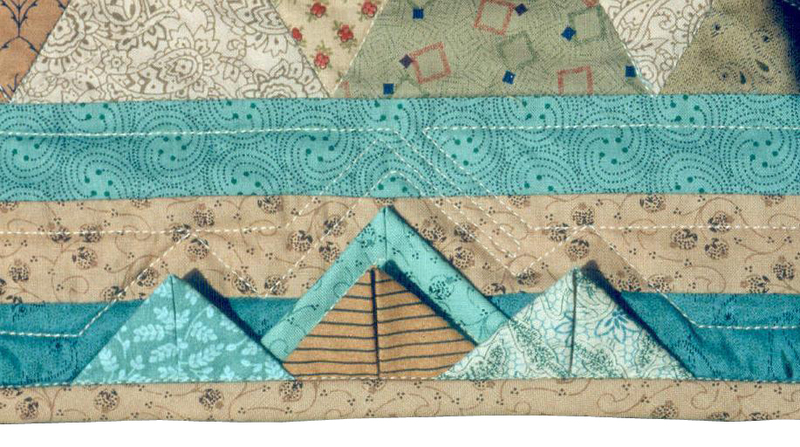 It was Lesson 4 in Five Things That Will Help You Become A Better Quilter. I had a major “opportunity” with this quilt as I put it in the frame. I didn’t call it that at the time, but looking back, my attitude was in the right place. Had it not been, I don’t know if I would have ever finished the quilt. You see, I was putting the quilt in the frame, and I accidentally pulled a little too hard. I sewed the rip shut, but I needed to hide my mending. I covered it with prairie points. That created another opportunity: I had four prairie points sitting in a lump on one side of the quilt all by themselves. That looked pretty silly. So I added more prairie points all around the outside edge. That made it look like that was the plan all along. 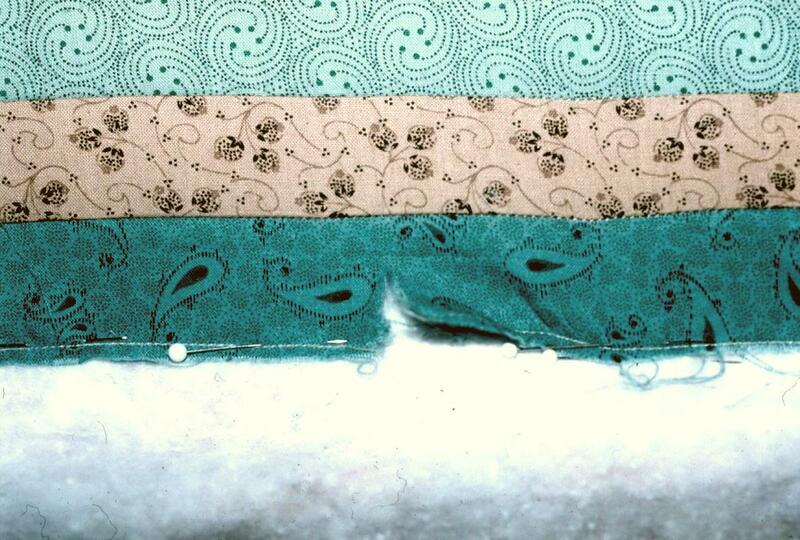 Not only did the prairie points give me a secondary design element, but it suggested a quilting motif too. Win-Win! Life is full of problems, large and small. “Opportunities” abound. It’s all in how you look at them. Hi Ami …now that’s a really smart way to cover up a mishap ..your idea or Scooter’s? LOL. By the way I have always enjoyed your newsletters (for years now). Wish I could to the Lancaster show this year but my guild had no plans for any bus trips this year….maybe because of the uncertain weather? Tired of all these snow storms and cold days. Regards to you and Scooter of course!!!! Jeannette, thanks for being a loyal reader! Sorry you’ll be missing the Lancaster show. Snuggle under a quilt and stay warm! I have been struggling with a word for 2014. Many changes are coming. Two huge quilt shows–Machine Quilter’s Showcase and Prairie Quilt Guild’s Common Threads Show–along with my husbands retirement and a move to another state. I’m not ready for all of them and at times it feels overwhelming. No more! It is all about attitude!! Thanks Ami. My word for 2014 is Opportunity. Brenda in Kansas where the snow is starting again :( Oh, wait!! It means more quilting time, more hot chocolate, and moisture that is always needed! Atta girl! You got the idea! The first thing to do when you move to another state is find to find the quilt guild and the quilt shops! Quilters can tell you everything you need to know. great idea I could have used it when Miss Pele my poodle decided to chew the edge of my quilt while I was sewing on another part. I think we’ve all been there, Becky! Prairie points how cool is that look and idea! Agreed! Sometimes opportunities mean you just have to dig in and do what needs to be done, but other times you get to learn something new. This morning I get to learn how to take my vacuum cleaner apart. But first I have to learn where I put the little screwdriver set. Had it in my hands last week. And, I suppose I then have to learn how to put the vacuum cleaner back together again. If I am remembering correctly… and what are the odds?… If you assign a number to each alphabet letter starting with A as One and then add up the numbers in the word, attitude, you come up with 100 or 100%. Attitude does make all the difference. You always seem to exude great attitude! You mean you DO have problems? I mean, opportunities! Just like the rest of us? Another thought which I found so true was the one put on the kitchen chalkboard along with shamrocks for March by my six year old granddaughter, Whitney. She wrote: ‘Your day will go the same way as the corners of your mouth!’ Seems like you and she are on the same wavelength. May we all join you! Oh yeah…I have “opportunities” a plenty! Last week I saw 2 quotes that should help us thru this never ending winter. “Attitude is everything, pick a good one!” and “The way your day will go depends on the way the corners of your mouth are turning”….so turn them up and head out! It’s going to be a great day! Those are good ones, Laura! I’m happy you enjoyed it, Sue!